If you're bringing a baby macaw home for the first time, it should have been fully weaned before it was allowed to leave the breeder. However, if you are breeding macaws, or have a pair who have mated, you'll find yourself needing to provide care for the chicks. 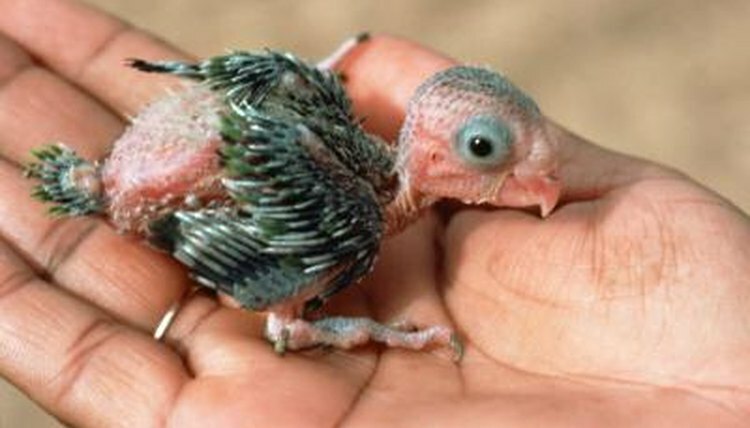 Hand feeding macaw chicks is not for the novice, as they are a difficult bird to properly hand feed from a young age. If you find yourself in a situation where you have no choice, it's best to consult a vet or a reputable macaw breeder before trying to hand feed newborns. If possible, it's best to allow the parents to feed and care for babies for the first two weeks. During this time, feed both parents a variety of nutritious foods such as raw vegetables and whole grains so they can pass good nutrition on to their chicks. Letting newborn chicks be fed by their parents not only ensures that they get the necessary enzymes and intestinal flora, but it's also better for their psychological development as it helps to teach them proper bird behavior. However, if the parents aren't feeding or properly caring for the chicks, you should remove them and begin hand feeding right away. Otherwise, for the sake of taming the chicks and preparing them to be good pets, begin feeding them by hand after 15 to 19 days. Prepare for hand feeding and caring for baby macaws by gathering the necessary tools. These include a scale for keeping track of each baby's weight, an incubator to keep the babies warm and soft bedding material such as cotton rags. Make sure the rags don't have any loose threads or loops that can snare the chicks. For feeding, you'll need pipettes for giving formula to very young chicks, and a spoon or syringe for older chicks. You'll also need antibacterial soap and a safe place to clean and disinfect your tools and hands, as well as cotton swabs for gently cleaning spilled formula off of little bird faces and bodies. Before handling the chicks, it's also important that you trim your nails close and remove rings to avoid injuring their tender skin. Before feeding a chick for the first time, it's a good idea to observe a feeding done by the parents so you can see how the chick's stomach looks when it's been fed the correct amount. This will help you gauge when the chick is full. Use a safe and comfortable container for holding the chick during feeding so that both of your hands are free. Rather than microwaving formula, prepare it with hot water. If you're feeding newborn chicks, the formula should be thin, but for older chicks it should be about the consistency of applesauce. Newborn macaws need to be fed about as often as a newborn human baby, but by two weeks they only need to eat about every four hours -- including overnight. Older chicks can have small amounts of strained meats and mashed fruits and vegetables added to their formula. At about 80 days of age, macaw chicks will start fledging -- that is, preparing their bodies to fly -- and are ready to be weaned. Begin weaning by offering formula in a bowl or container and allowing them to feed themselves. In the beginning you might need to continue hand feeding on occasion to make sure they get enough, but don't be alarmed if the chick loses weight. It's normal for the chicks to slim down in preparation for their first flight. Once they learn to feed themselves formula, introduce the adult diet, which is the same type of foods you've been feeding the parents. Macaw Pediatrics: Baby Care Suggestions, Hatching Through Weaning.